I just bought the latest Cintiq Pro 16", and am getting cursor latency of several centimeters. Is this normal? The website advertised "virtually no lag", and this is not even close. Even the iPad performs better. I feel like I have been lied to in a big way. I double checked my cpu and gpu usage, and they are all very low use, which means it's either the hardware is truly that slow and I was sold a lie, or the driver is not sending the data fast enough for some reason. I am hoping it's a driver issue on the Mac, but I don't have a windows computer to test with. If it is a Mac driver issue, my only thought would be that maybe the OS is delaying sending the Carbon Events fast enough. So now I am looking at the linux kernel driver to maybe connect directly to the hardware without the middleman message passing, but from looking at the code on the input-wacom GitHub, it looks outdated and possibly missing support for these newer Cintiq's. I'd like to hear from some other Cintiq owners if they actually have massive cursor latency too, and the advertising is just a lie, or if I should continue mucking around and try to install linux and edit the kernel driver to support my Cintiq, just to see if it's any faster. Hi, can you please confirm if this is latency or an offset. It's better to refer to latency in seconds. In Cm is normally how we measure an offset. On the hardware level, if everything is working as expected there should be no lag at all. When we state "virtually no lag" is to account for external issues we cannot control via hardware, i.e. slow render times, GFx issues, etc. Did you calibrate the pen? Did you check and run any firmware update from the Wacom Desktop Center? Which driver version did you install? Does the lag occur all the times or only when drawing a stroke in a specific application. If only with specific App, which one? Simply put, when I drag the stylus on the screen with no apps open, the cursor is not directly under the stylus and has to catch up. The faster I move the stylus, the further behind the cursor is visually. 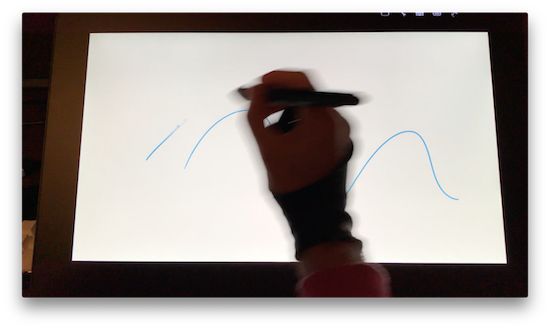 The time it takes to catch up, results in long fast strokes being visibly centimeters behind the current stylus position. I have calibrated the pen, updated to the latest driver, and my Mojave system preferences are correctly set. If everything is setup correctly, should the cursor always be directly under the stylus even when moving the stylus? I just want to get that crystal clear. Because that is not even close to the experience I have. I'm an experienced developer, and if this is simply a matter of wacom's mac driver having a delay or the carbon event system is just a slow system, then I am willing to do the work to write my own driver. I just need the facts crystal clear so I don't waste my time in the case that the real issue is simply the hardware design of the Cintiq itself. Can you restate what you were trying to say about the "virtually no lag" advertisement with more clarity. I can not clearly understand your statement. The website says the "response rate" is 25ms. Can you clarify what this actually is referring to? I feel like this may be a clue, and a round about way to document cursor position delay. Where perhaps this 25ms gets translated to several centimeters on fast long strokes. If that is truly the case, then so be it, but I digress back to the "virtually no lag" statement being false advertising. I just talked to someone on the wacom support chat, and they said that lag is normal and expected from the hardware. As much as I wanted to believe it was just a driver or Mac problem, the truth is that I was sold a lie. And what is even more mind bending is that a lot of the users adopt the lie and spread it around further in their reviews of the product. I literally placed an order, because a week ago, I watched Aaron Blaise on live stream unbox the cheaper 16", and exclaim how there was no lag. I then went to the wacom website, and it said "virtually no lag" with a picture of the stylus on top of the stroke cursor, implying that there is no lag. I then order it, to find there is horrible lag. And it's not just the fact that there is lag that is appalling, but that everyone seems to skirt around the issue. It's like somehow saying there is no lag, has brainwashed the users. The mass mental hypnosis implied by this whole situation is just baffling to me. Where are the sincere reviews that point out the serious problems with this product? Surely, if the 32" really has a higher response rate to reduce the lag, that would be a key selling point, but this seems to be completely disregarded; Likely because if they did point that out in the marketing it would directly reveal how bad the lag actually is. Let us recall what happened in the children's fairy tale, "The Boy Who Cried Wolf", and how the people after being lied to, came to not trust what the boy said. By lying to people, wacom is setting themselves up for failure in the future, so that when they actually do make a decent product with no lag, people won't jump up and buy it specifically for that feature, because you have framed what they already bought as no lag, which as has now been clarified, is a complete outright lie. I still don't know what kind of lag you are experiencing so I can't tell you if it is normal or not. What is normal is that in faster strokes, the cursor falls behind a little bit. This is present in all our display devices and is mainly due to how the tracking system works. However you could be experiencing abnormal cursor drag for many different reasons so before anything else, I would like to see what you see so I can then advise you accordingly. Are you able to share a video and do some slow and fast strokes? Preferably with a drawing software for better representation. So does that mean that the pixels in the display update at 40 fps? That seems pretty low, and would explain the visual stuttering I see. The person I was talking to in the chat said that what I am experiencing is normal, and that it is slightly better on the 24", so if the "response rate" is not the relevant specification that documents how much cursor lag each device has, where is it documented? When you say it's how the tracking system works, I assume your talking about how quickly the onboard hardware can measure the voltages from the coils and pass the data on to the computer, and not the driver software? This implies that the 24" has a faster hardware circuit to read and process the voltages than the 16", but I do not see this documented anywhere, which to me seems like the most important spec to document considering how big the lag is. morelightning wrote: So does that mean that the pixels in the display update at 40 fps? That seems pretty low, and would explain the visual stuttering I see. It's not directly conneced to FPS. Response time is the time the pixel takes to change from black to white and back to black. 25ms is the average for modern day standards. Thank you I can see the drag you are experiencing now. morelightning wrote: The person I was talking to in the chat said that what I am experiencing is normal, and that it is slightly better on the 24", so if the "response rate" is not the relevant specification that documents how much cursor lag each device has, where is it documented? I am not aware of it being better or worse between device models. I have not seen any documentation regarding this. We use the same technology throughout the Pro line. morelightning wrote: When you say it's how the tracking system works, I assume your talking about how quickly the onboard hardware can measure the voltages from the coils and pass the data on to the computer, and not the driver software? This implies that the 24" has a faster hardware circuit to read and process the voltages than the 16", but I do not see this documented anywhere, which to me seems like the most important spec to document considering how big the lag is. For the tracking is something along those lines. Then Pen also plays a big factor in the response time. As stated earlier, I am not aware of these differences and this is not documented. To be honest, the drag is something that either really bothers you, or you just won't even notice it. From what I see in your video, it's the same drag I experience with other models and I don't think it is a defect. Unfortunately, there is no way to improve on it with firmware or software updates so my best, honest recommendation is that you return the device if you are not satisfied. I will forward your feedback to the team regardless of your decision. I'm sure this can be improved in future generations. After seeing Tom Brancroft's review of cheaper non-Pro 16" demonstrating much less lag, I asked another artist to video tape his non-pro 16" and shockingly it had way less visible lag than my Pro 16 as well. Now I don't know what to think about this whole debacle. Now I'm left with something that lags way more than the half price cheapo model, has a worse screen because of the etched glass grainy nonsense, and has increasing connectivity issues. Welcome to the club of "satisfied" customers. Don't lose your mind over it, it is actually something you can get used to it because of muscle memory unless you are drawing on paper simultaneously, then you will go nuts. I never thought I would look at alternatives, some of them are quite promissing and some have even worse lag issues. This degree of lag is not something that I will get used to, and way below the standards I've been using for the last year. The entire situation is just unacceptable. Along with the other problems, the degree to which it impedes the professional workflow output is so great that the more likely decision will be that I will simply drop support for wacom throughout my entire software line completely. I'm not the kind of software developer who is going to continue to support bad hardware just because they have hypnotized the populace with the false marketing. The only reason I even kept it after the first day was to keep an open mind that maybe, just maybe despite it's horrible problems it might eventually show some practical use in the studio workflow, however it has consistently failed to perform. When it comes to an art studio's output as a business, we can output higher quality work faster on even the iPad, and that's just pathetic. 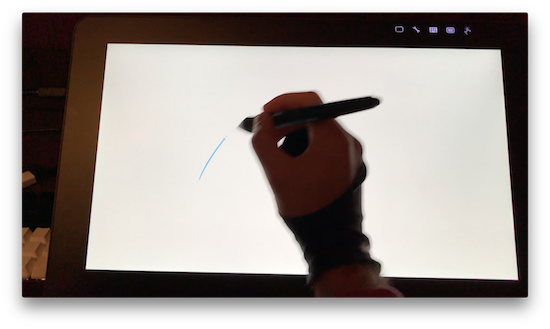 The Cintiq Pro 16 is simply the worst product I've brought in a long time, and has been a complete disappointment, and I find the way the wacom customer support responded to the issues through all the mediums I used to be appalling.